Firstly I wish to say Massive thanks to The UK Crime Book Club and their charity auction which was held early this year. I was one of the winners of a name of my choice being used as a character in a story. The name I asked for was Freddie Laidler, one of my grandsons, where he is an Inspector in the first story in the book by author T.K. Geering who generously took part in the auction. I love this story so much so huge thanks to you. The whole book is a belting read, I really can’t praise it enough. 8 British Christmas shorts from the Wild Wolf stable to get you ready for the Holidays. 1: A Corpse for Christmas by T.K. Geering ~ While Jack the Ripper is terrorising Mitre Square, bodies are going missing too. 2: Gabriel by Elaina J Davidson ~ Old houses keep old secrets. Ivy discovers that not everyone loves Christmas as much as she does. The dude in the mirror is trying to kill her! 3: The Sins of the Season by Richard Rhys Jones ~ At a time when the gentry rule us peasants, a vicar in a remote parish has his hands full of the deadly sins. Once a druid enters the opulent halls of shame, it all gets bloody interesting. 4: Stocking Killer by Jillian Ward ~ Of all the times of the year to cheat on her man, she chooses now! Well some dude needs a lesson to keep his hands off and Dave is on it like a man possessed; it doesn’t end well for any of them. 5: Christmas Nerd by Joanne Sexton ~ Her family was brutally murdered on Christmas and this holiday is dreaded by her every year since. That’s until the cute IT guy makes his move and Kaley gets to have a family Christmas for the first time in decades. The problem with good looking guys is they always have issues. 6: On the Twelfth Day of Christmas by Paul Rudd ~ Thrown back into the 80s we follow Tommy and his friends through the most treacherous board game ever created. It’s awesome, it’s ruthless, and the entire town is now dead! If a stranger tempts you to play a game for the 12 days of Christmas, you might like to reconsider. 7: The Secret of Hungry Summit Mountains by Hannah Ferguson ~ Eloise was just another girl until she was attacked by a vagrant. This one act derails her entire life, leaving her homeless, pregnant, desperate, and depressed. Getting home for Christmas didn’t even cross her mind. 8: The Whispers of Christmas by Poppet ~ Angela is living in a reality that keeps warping. She’s hearing things, has a stalker who’s gas lighting her, and is forced to get high when she goes home for Christmas. Then things get really weird. It’s just ANOTHER BLOODY CHRISTMAS for these characters, but what the hell, we only live once. This is one mega book full of exceptional talent. Eight authors have come together to create the perfect Christmas book for horror readers, with each story having the Christmas thread as a common factor but very individual, unusual and totally thrilling. A Corpse for Christmas brings a little of everything to the reader with the hunt for Jack the Ripper, body snatchers and murder done in a most tasteful manner! The whole story just surrounds you with its vivid concoctions of smells and tastes of a bustling London heading towards a cold and snowy Christmas time. There are some real hard-hitting and memorable characters in story lines that you want everyone to come out on top of. A belting first up story! Gabriel is one creepy tale that heightened my already uneasy feeling about mirrors. Ivy discovers more than just her reflection in the mirror and what has been put into motion isn’t just going to go away. I do love an author that puts that tingle down my spine as the supernatural element is very much an unpredictable mind play seed that comes back when you don’t expect it. The Sins of the Season is a tale of warning, don’t preach what you don’t do yourself. When a down and out comes knocking on the door asking for help on a cold winter night, he is turned away, only to be found frozen to death. The following year someone else comes to the door. This is a story that will make anyone dig deep into their pockets to help the less fortunate. Stocking Killer is a story of a Santa that fills more than stockings hanging from the fire-place and someone is after making him pay. This story did have me chuckling at different points, I just couldn’t help it. I really didn’t know who to feel sorry for as it seemed one bad decision just lead to another on this story of revenge. Pure joy! Christmas Nerd is a belting read. You know the stories that have that character you want to at last have something good because so far life has been anything but, well this is that story. This is my sugar rush story but replaced by horror as it got me wide awake and hunting for statins. Loved it! The Twelve Days of Christmas is a cracking story for gamers, plenty of which I am sure will be around through this season with their new releases. Well for a group of young players it has life changing consequences. I really love these type of stories, being a gamer myself many years ago. This is brutal with all or nothing stakes. A games not for the faint hearted. Super story. The Secret of Hungry Summit Mountains is a sad story that spans decades, a real tale of woe and wrong doing. A terrible secret festering in a young girl who had no-one to turn to. Such a heart breaking story from every side. The Whispers of Christmas I loved this story which I felt is a perfect ending for the book. Imagine having a feeling that someone has been in your home, a smell that you catch that isn’t your fragrance or a noise in the distant. This is an eerie story that I felt myself fall into further on every page, intriguing I really wanted to know how certain things could possibly be happening. Was this young lady insane? Absolutely loved the ending. 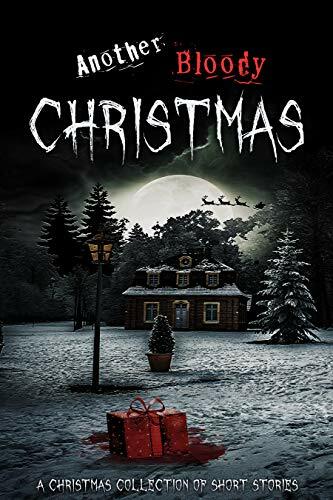 I know this is just a taster of each story, my thoughts and feelings but this really is a superb collection of not just Christmas horror but of characters at all levels you can relate to. From the past and into the future each is memorable in its own right. It has left me wanting to read more from each author. Highly recommended!